To illustrate the cartoon character on a modified version of a car is difficult. 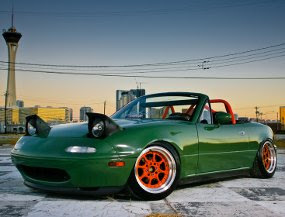 But unlike the Mazda Miata that is able to realize the character of the ninja turtles on his body. Somehow, though we know this car inspired from the cartoon series Ninja Turtles, we do not know who is this, if this is Raphael, Donatello, Michelangelo or Leonardo. But certainly, as reported in autoevolution.com, (31/12/2010), alert the car owner in 1990 is rumored to want to build a car such as the Mazda MX 5, which is famous for its power and speed. The first part of the engine is touched with a variety of accessories ranging from installing a Catalytic Converter from Magnaflow, then no more RB Air Intake for cars is more heat resistant and clutch of Flyweel Fidanza so at first became a big attraction. To make a ninja turtle car is more similar to the Mazda MX 5. The owner also changed the suspension to make it stable despite having to run on straight roads or tight turns the corner with RB Sway Bars and the latter to maintain security even when braking the owner replace the existing standard brake Fatcats used by racing cars. And to make the car this ninja turtles appear more sweet and more confident rim size 15x8 inches wrapped with 195/45 size tires that were paired with matte red at the foot of the turtle, which in turn makes the car ninja turtle is ready through the hustle and bustle of the city.